While Finaject itself is no longer available, in some cases injectable preparations from Finaplix have been made. The substance is the same: trenbolone acetate. There is no evidence in the literature, nor I think practical evidence, that trenbolone acetate has a "special role" in burning fat. Rather, it is an extraordinarily potent AAS, being about three times as effective per milligram as testosterone esters. This seems to apply only to Class I activity, however. To obtain good anabolism from non-AR-mediated mechanisms, a Class II steroid such as Dianabol or Anadrol should be stacked. Trenbolone is a steroid having the advantages of undergoing no adverse metabolism, not being affected by aromatase or 5alpha-reductase; of being very potent Class I steroid binding well to the androgen receptor; and having a short half life, probably no more than a day or two. Fifty milligrams per day is a good dosing for someone on his first cycle or someone who is as yet less than, say, 20 pounds over his natural limit; while 100 mg/day may be preferred by the more advanced user who has already gained more than this. These doses are assuming that trenbolone is the only Class I steroid being use. There really is no need to stack another -- testosterone being the only sensible exception -- but if another is stacked then the amount of trenbolone may be reduced accordingly. Since Finaject is the acetate form of trenbolone, its effect lasts only a short time and frequent administration is necessary. 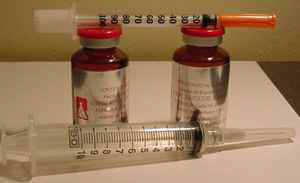 Most athletes inject I ml (30 mg) every second day. Higher dosages such as, for example, 30 mg/day or 60 mg every two days, however, were not unusual since an enormous strength gain and also a strong but still high-quality muscle gain was obtained. Finaject does not aromatize since its substance is not changed into estrogens. In combination with Winstrol it has a dramatic effect on the body's appearance. To achieve a gigantic strength gain bodybuilders used to combine 30 mg Finaject every 1-2 days and 50 mg Winstrol Depot every 1-2 days (also known as Strombaject) during preparation for a competition and the buildup phase. No other combination gives the athlete such an incredible hardness and such a defined muscle gain. The possible physical change obtainable in only a few weeks is enormous enough to shock some non-involved observers. Believe us, competing bodybuilders love this combination especially. Finaject was also part of probably the most effective stack for mass buildup. Together with Dianabol or Anadrol 50, and testosterone, "Fina" builds up strength and mass in record time. Another way of administration which is far less dangerous, can be prepared as follows: the ground pellets are mixed with a mixture of 50% water and 50% DMSO (dimethyl sulfoxide). Then the mixture is put on the skin and allowed to soak in. Dimethyl sulfoxide is used to transport the substance trenbolone through the skin. Using this method approximately 40 mg of the substance can get into the blood without much harm. Order Finaplix (Trenbolone) and other steroids by mail order!